Thai cuisine is very much similar to our Indian cuisine. When we dine out we prefer to try out different cuisines. Thai tops our list! P loves spicy food and Thai red curry is his favorite. I have not tried making Thai food from scratch. I usually resort to pre-made pastes to satisfy our cravings. 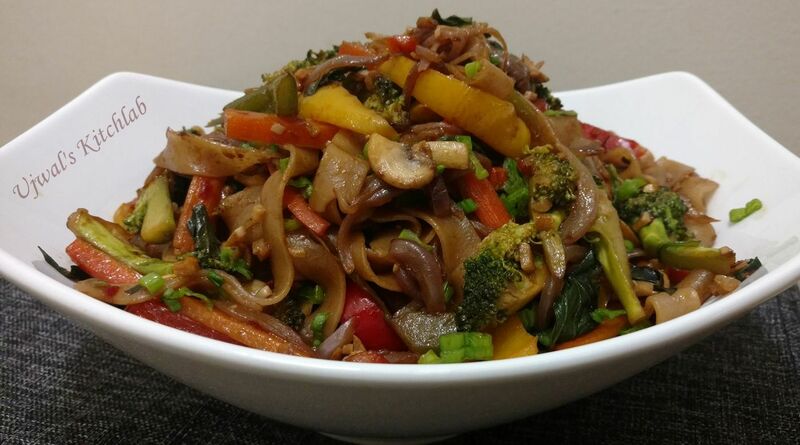 A friend of ours introduced us to Pad Kee mao or The drunken noodles, and it was love at first bite. This became a regular while dining out until one day I decided to try it out at home. The main reason for me to try this at home was the amount of oil used in restaurants. Also being a vegetarian I was never sure of the sauces being used. Hence began my quest for the recipe. Google gave me quite a lot of recipes. I checked them all and finally when I started cooking this recipe evolved. Feel free to play around with the sauces and veggies of your choice. I skipped tofu and baby corn in this since I did not have it in hand. Adding it would definitely elevate the dish even further. 1) Soak the rice noodles in warm water until al-dente. The noodles should have a bite in them after being soaked else when tossed in sauce it could break and turn into gloopy mess. 2) Mix all the ingredients under sauce well. Keep aside. Keep all the sauces and veggies ready as this is to be cooked on high flame. 3) Heat a wok on high. Add oil. When the oil is hot, add in the finely chopped garlic and saute for few seconds. Add in the sliced onions, white part of spring onions, saute. Add in rest of the veggies and tofu (if using) except the greens of spring onion. Saute until the veggies are half done. If the veggies are cooked further they would end up soggy and soft which would affect the over all taste of the final dish. 4) Add in the sauce mix and half of the basil roughly torn. Add in the soft noodles and saute. The sauce mixture already has quite a good amount of salt so watch out when adding salt. At this point do the taste test and check if it needs any seasoning. I added a little bit of chilli garlic paste at this point to notch up the spiciness. 5) Finally add in all of the basil. Give it a quick stir. Transfer the noodles to serving bowl, garnish it with spring onion greens. Enjoy! P.S: I used regular rice noodles that we normally use for Pad thai. The freshness that Thai basil renders to this dish cannot be replaced with Italian basil.